While the overall state of healthcare in India has improved over the past 10 years, it still continues to be one of the key concern areas particularly for the rural population in the country. Access to quality healthcare is still a challenge and we are far away from fulfilling the WHO norm of having 1 doctor per 1000 people. 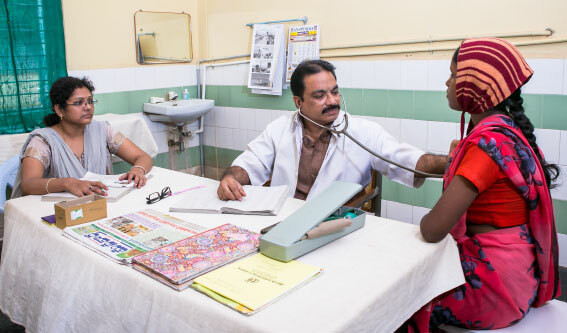 Srinivasan Services Trust (SST), the CSR arm of TVS Motor Company, works closely with communities in rural India to educate them on health issues in their vicinity and focus on preventive healthcare. SST Support primary health centres to organize health camps from time to time to encourage preventive healthcare and educate people on hygiene and sanitation to avoid communicable diseases. These camps are held by respective PHC/ HSC in 5000 villages across 5 states and help spot common issues relating to rural health care. Supporting the hands by SST on health department programs aim to enable women and children towards Ante natal and post-natal care, reduce malnutrition and access the care they need. Awareness and facilitation initiated by SST include motivate community on building toilets, utilisation of government programs for potable drinking water and ensuring better nutrition.